Every once in a while I realize that I really don't appreciate my dishwasher for the one or two loads it runs every single day without any problems. It's when it stops working flawlessly that I feel like I should have thanked it for all the hard work it was doing. Maybe, if I had shown a little more appreciation, I wouldn't be finding bits of dried food on dishes and white spots on our glasses. If you have cloudy glassware, film on your silverware or streaky dishes it is not your dishwasher’s fault. It is today’s reformulated detergents that can leave dishware cloudy. In July 2010, a ban on phosphates required the reformulation of dishwasher detergents. Since then, consumers have noticed that their dishes are just not as clean as they used to be. In fact, many experience a cloudy film on their glasses and dishes that can build up over time. Some consumers may have even considered replacing their dishwasher to try and resolve the problem….but it’s not the dishwashers fault! 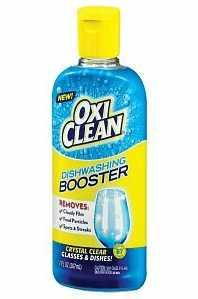 OxiClean Dishwashing Booster can eliminate spots, residue, and cloudy film in just one wash and then keep dishware crystal clear wash after wash.
14% of people don't know what phosphates are, and 55% don't know that they were banned from detergents. You can definitely include me in that 55%. I thought that the problem was me–that I wasn't loading the dishes correctly, that I wasn't using enough detergent. Now that I know that the detergent itself isn't as high-performing as I had thought. 49% of people feel frustrated because they don’t know what’s causing the spots on dishes. Top three things that consumers believe cause the spots/cloudy dishes are dishwashing detergent (50%), hard water (34%), dishwasher not working well (30%). Over half (56%) have switched their detergent 2-5 times. 88% agree or strongly agree that it is embarrassing to serve on dishes that have spots or are cloudy. Almost 1 in 3 (32%) say their biggest kitchen challenge is achieving sparkly dishes; 30% say spots on dishes are their biggest kitchen complaint. Keeping all this in mind, I received a bottle of Oxiclean Dishwashing Booster and a clear lucite tray to see if my dishwasher performed better using Oxiclean. I then followed the instructions on the bottle for the first use: I added two squirts of Oxiclean Dishwashing Booster to the bottom of the dishwasher and I filled the rinse agent compartment with more Oxiclean Booster. I used the regular amount of dishwashing detergent and ran a full washing cycle. I tried and tried to get a good picture of the tray after it was washed in the dishwasher, but it just didn't/couldn't happen. Do you have any idea how difficult it is to take a photo of a flat, clear, perfectly clean item when you only have amateur photography skills? I can tell you: it's impossible! But did you notice when I said, “perfectly clean”? The tray was as clear as polished glass. Not a water spot or food particle to be found! I had plenty of glassware in the same cycle, and I was so thrilled to see them without any spots, too! 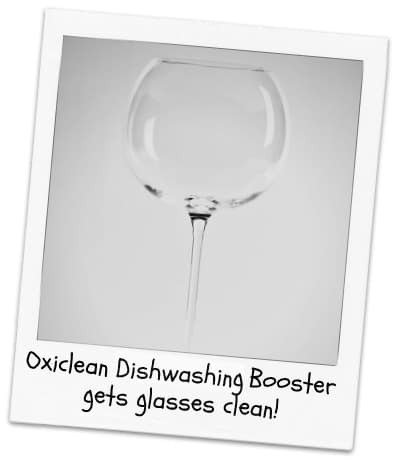 Have you used a dishwashing booster? What do you use in your rinse agent compartment? 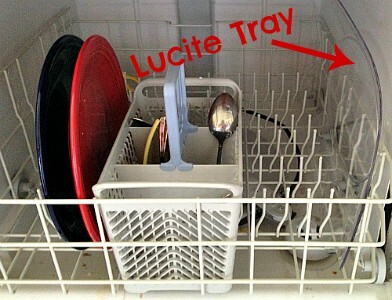 If you have any other tricks for keeping dishes clear of water spots, I'd love to hear them! Make sure you connect with OxiClean on Facebook to get the latest brand information, coupons and more! 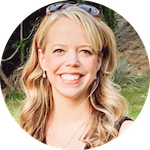 I wrote this review while participating in a blog tour by Mom Central Consulting on behalf of OxiClean and received a product sample and serving tray to facilitate my review, and a promotional item to thank me for taking the time to participate. I recently found out that vinegar works great as a rinse agent. It is super cheap and doesn’t use harsh chemicals on the dishes that I use to feed my family. There is no stinky vinegar smell while the dishwasher is running or on the dishes. I will definitely be sticking with vinegar for years to come.